Pau Gasol i Sàez (pronounced IPA [ˈpaʊ̯ gəˈzɔɫ]) (born July 6, 1980 in Sant Boi de Llobregat , Barcelona , Spain ) is a 2.13 m (7 ft.) Spanish professional basketball player for the Los Angeles Lakers of the National Basketball Association (NBA). He was born to Marisa Sàez and Agustí Gasol, and he spent his childhood growing up in Spain. Gasol's brother, Marc Gasol, is also a professional basketball player.Gasol was drafted by the Atlanta Hawks in the 2001 NBA Draft, but his rights were traded to the Memphis Grizzlies, where he won the NBA Rookie of the Year Award. He currently holds the Memphis Grizzlies franchise records for career games played, minutes played, field goals made and attempted, free throws made and attempted, offensive, defensive, and total rebounds, blocked shots, turnovers, and points. After seven seasons with the team, Gasol was traded to the Lakers on February 1, 2008, and a USA Today newspaper article said he was "the major factor in turning around a storied NBA franchise and making it hip to be a Lakers fan again." Gasol began playing basketball with his school team called Alvirne, and he eventually signed with Cornellà. When he was sixteen, he began playing for Barcelona's junior team. He also won both the 1998 Albert Schweitzer Tournament and the 1998 FIBA Europe Under-18 Championship. 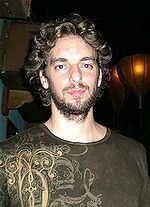 After moving to the senior team of Barcelona, Gasol played just eleven total minutes in the 1998-99 season, and averaged under 15 minutes per game in the next year. However, in his final season in Europe, Gasol averaged 11.3 points and 5.2 rebounds in just under 24 minutes per game. Barcelona was victorious in the Spanish National Cup championship game in 2001, and Gasol was named Most Valuable Player. After entering the NBA Draft, Gasol was selected third overall in the first round in the 2001 NBA Draft by the Atlanta Hawks, who traded his draft rights to the Memphis Grizzlies in exchange for Shareef Abdur-Rahim. In Gasol's first season with the Grizzlies, he won the Rookie of the Year Award, and was named to the All-Rookie first team. He averaged 17.6 points and 8.9 rebounds per game, and was also the only team member to play in all 82 games that season. Gasol led the team in scoring (19.0 points per game) in his second year with the team, and for the second year in a row, played in all 82 games. Gasol missed the first game of his career, during his third year, with a foot injury on April 5, 2004, which snapped his string of 240 consecutive games played. He grabbed the 1,500th rebound of his career on November 12, 2003, against the Orlando Magic and scored his 3,000th career point on October 31, 2003, against the Boston Celtics. Despite having 22 points in Game 4 against the San Antonio Spurs, the highest by a Memphis players in the playoffs, his team was eliminated in the first round, not winning a single game against San Antonio. This was both the Grizzlies and Gasol's first trip to the NBA Playoffs. He scored 31 points and blocked four shots on January 11, 2005, against the Indiana Pacers to earn 5,000 points and 500 blocks in his career, becoming the 10th fastest player to reach 5,000 points/500 blocks since 1973-74. He also helped his team make it to the playoffs for the second time in his career, but they were eliminated in the first round and did not win a single game against the Phoenix Suns. In his fifth year with the team, he became the franchise’s all-time leading rebounder on March 24 against the New York Knicks when he grabbed his 3,072nd rebound in a Grizzlies uniform. He made 29 consecutive free throw attempts from January 24 to January 28, tying the second best mark in Grizzlies history, including two straight games going 12-12 from the line, tying the best single-game mark in franchise history. Gasol and the Grizzlies returned to the playoffs for the third time in his and his team's history. Once again, they were eliminated in the first round and did not win a single game against the Dallas Mavericks. On February 9, 2006, making his first appearance, Gasol was selected to play in the 2006 NBA All-Star Game in Houston, Texas as a reserve center for the Western Conference. At the time, he was one of four players ranked among Western Conference forwards in the top ten in points, rebounds, assists and blocked shots. He was the first Spanish basketball player as well as the first Grizzlies player to ever make it to the All-Star Game. Gasol missed the first 23 games of the 2006-07 NBA season due to a broken foot suffered near the end of Spain's semifinal win over Argentina in the 2006 FIBA World Championship. He would go on to be named Most Valuable Player of the tournament, which Spain won. He had a season-high 34 points (most by a Grizzly that season), and eight rebounds and tied a career-high and franchise record with eight blocks on January 29 against the Sacramento Kings, and surpassed Shareef Abdur-Rahim as the franchise's all-time leader in free throw attempts on January 31 against the Dallas Mavericks. He became the all-time franchise leader in field goals made on February 6 against the Houston Rockets, and became the all-time franchise leader in minutes played on February 7 at Dallas. He surpassed Shareef Abdur-Rahim (7,801 points) as the Grizzlies' all-time leading scorer on March 7, 2007, against the Toronto Raptors (7,809 points at the time). On January 24, 2007, Gasol recorded his second career triple-double against the hosting Utah Jazz, garnering 17 points, 13 rebounds, and 12 assists. He also registered 2 blocks and one steal. On February 1, 2008, Gasol was traded to the Los Angeles Lakers along with a 2010 second round draft pick for Kwame Brown, Javaris Crittenton, Aaron McKie, the rights to Marc Gasol (Pau's younger brother), and 2008 and 2010 first round draft picks. Albeit, there has been a bit of controversy surrounding the trade. Chris Wallace denied in an ESPN article that he had been ordered by owner Michael Heisley to make the Grizzlies more attractive to a potential buyer. Heisley has been trying to sell the franchise for two years. Wallace said, "No one put pressure on me to do this, and Michael Heisley has actually been reluctant to move Pau." He also said that they had been "trolling" the waters for a while and dealt with a number of teams. He selected the Lakers deal because "it didn't get any better than this." When Gasol departed the Grizzlies, he held twelve franchise records, including games played, minutes played, field goals made and attempted, free throws made and attempted, offensive, defensive, and total rebounds, blocked shots, turnovers, and points. Per game statistics, he leads Memphis in defensive and total rebounds along with blocked shots. On February 5, he made his first Lakers appearance in a game against the New Jersey Nets, during which he scored 24 points and had 12 rebounds in a 105-90 win over the Nets. On March 14, Gasol sprained his ankle in a game against the New Orleans Hornets, stepping on the foot of teammate Vladimir Radmanović in the first quarter. Gasol was expected to miss the remaining three games of the Lakers' road trip after x-rays came up negative. Gasol returned to the starting lineup on April 2 against the Portland Trail Blazers and played nearly thirty-two minutes, registering 10 points, six rebounds and seven assists. He admitted to feeling limited with the swelling in his ankle still present. Gasol helped the Lakers finish the regular season with the best record in the Western Conference (57-25), with him in the starting lineup the Lakers went 22-5. Kobe Bryant has also stated that playing with Gasol clicked from the start. In the Lakers first win over the Denver Nuggets, he contributed 36 points, 16 rebounds, 8 assists and 3 blocked shots. When the Lakers swept the first round of the 2007-08 playoffs against the Nuggets, it was Gasol's fourth trip to the playoffs and the first time he had not been on the losing end of a series. His previous team, the Grizzlies, did not make it to the playoffs for the second year in a row. This was Gasol's first trip beyond the first round as his team, the Lakers, made it to the Conference finals after defeating the Utah Jazz. He contributed 17 points and 13 rebounds in the Lakers clinching win to advance them to the conference finals. On May 31, he recorded a career high 19 rebounds in an NBA Western Conference Finals clinching win against the San Antonio Spurs. This marked his first trip to the NBA Finals, and he became the first Spaniard to reach the finals. Gasol scored 14.7 points per game on .532 shooting in the 2008 NBA Finals against the Boston Celtics, below his scoring average of 18.9 points a game during the regular season, however, he led the Lakers in rebounding with 10.2 rebounds per game throughout the championship series, up from his regular season average of 8.4. Los Angeles lost in six games against Boston in the Finals, including a 131-92 loss in Game 6. During the 2008 NBA Playoffs, Gasol was the second best Laker in points (16.9), rebounds (9.3) and assists per game (4.0). He also led the team in blocks per game (1.90) and was tied with Lamar Odom with the most postseason double-doubles (10). Gasol was selected to his second All-Star appearance as a reserve for the Western Conference squad during the 2008-2009 season, his first as a Laker. He was also named Western Conference Player of the Month after helping the Lakers to an 11-2 record for the month of February that included road wins over Boston and Cleveland. He finished the 2009 regular season with averages of 18.9 points, 9.6 rebounds, 3.5 assists, and 1 block per game. Gasol then won his first NBA championship ring when the Lakers defeated the Orlando Magic in the 2009 NBA Finals. Gasol is currently in his eighth year in the National Basketball Association (NBA). He is very athletic and quick for a 7 footer, and plays the power forward and center positions. He has often been compared with fellow European players Toni Kukoč and Dirk Nowitzki, holding career averages of 18.8 points, 8.6 rebounds and 3.1 assists per game. He is a refined scorer from both inside and midrange, his overall game is near-ambidextrous, and makes it difficult for opposing teams to defend. Gasol uses a variety of midrange jumpers, hook shots, up-and-under moves and shot fakes to score very efficiently. He is also an above-average shot blocker, with a career average of 1.8 blocks per game. Statistically, he shoots 22.7 percent when it comes to three pointers. Before being traded to the Los Angeles Lakers during the 2007-08 season, he had only played with the Memphis Grizzlies from 2001-2008. When he was traded to the Lakers, he maintained the same number on his jersey, still playing with the number 16. In his career, Gasol has never been ejected. Gasol scored his 10,000th point in a game against the Jazz on the 2nd of January 2009. He finished with 21 points, 11 rebounds and six assists in the win. NBA Rookie of the Year (2002). All-NBA Third Team selection (2009). 2-time NBA All-Star (2006, 2009). Pau Gasol's mother, Marisa, is a medical doctor, and his father, Agustí, is a nurse administrator. When Pau was born, his family was living in Cornellà , but he was born in Barcelona , at Sant Pau Hospital , where both of his parents worked. When he was six years old, his family moved to another Barcelona suburb, Sant Boi de Llobregat , where he spent the remainder of his childhood. Gasol was never interested in football, but loved basketball. The first sport he played was actually rugby, before switching to basketball. He is described as "a family boy and the perfect student, a tad shy, and a bit of a joker." His younger brother, Marc, who is 7'1 feet tall and 280 pounds, is also a professional basketball player, currently playing for the Memphis Grizzlies. Marc was drafted by the Los Angeles Lakers, 48th overall, in the 2007 NBA Draft and his rights were traded to the Memphis Grizzlies, as part of the deal that sent Gasol to the Lakers. Gasol currently resides in Marina del Rey and is single.